When thinking of the title for this post I really wanted something that did the fragrance justice – a title that simply showed just how iconic it is. After numerous plays on words and dodgy puns about illegal substances I settled on just one word – five letters that sum up everything and says all that needs to be said about this legendary fragrance – that word is Opium. As far as fragrances go, Opium is beyond legendary. Opium is mythical – an emblem of perfume at its greatest, boldest and most fearless. It is a fragrance that courts controversy, with its very name hinting at the dark underbelly of humanity, and its olfactory trail being the largest and most intense the world has ever seen. Opium is the a heavy-duty piece of kit in a perfume lovers arsenal, and for that it deserves a lot of respect. Opium may be YSL’s most famous (read: infamous) fragrances, but it was not his first. Launched in 1977 and inspired by oriental chinoiserie, the fragrance (which was created by perfumers Jean Amic and Jean-Louis Sieuzac) was controversial right from the word go, with its name gaining criticism from many groups for condoning the use of drugs. Of course, there is no such thing as bad publicity and this uproar helped spread the word about the fragrance and was a large contributor to its success. Controversy struck again in 2000 when YSL’s Director, Tom Ford (another fashion genius) and Photographer, Steven Meisel created a provocative print campaign for Opium featuring a naked Sophie Dahl writhing around in ecstasy. 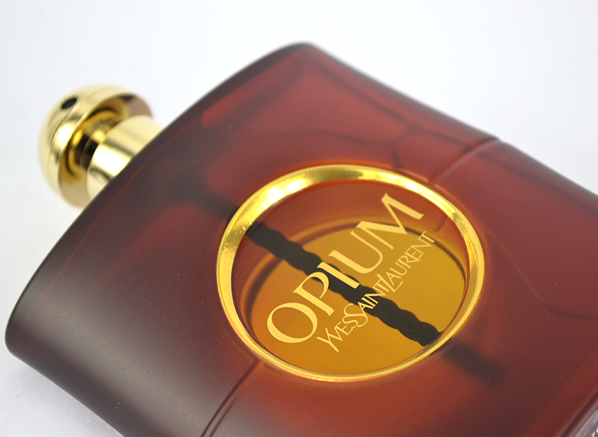 Controversy aside, Opium is a thoroughly well made fragrance that is indicative of the larger than life and decadent style of the 1970s and ‘80s. If the scent itself isn’t enough to convey this, here’s a little description of the launch party thrown by Yves Saint Laurent, to celebrate the birth of an icon: “a tall ship Peking was rented from the South Street Seaport Museum in New York’s East Harbor, and writer Truman Capote sat at the helm of the ship at the party. The ship was draped with banners of gold, red, and purple, and the Oriental theme was displayed with a thousand-pound bronze statue of the Buddha, decorated with white cattleya orchids” . If that doesn’t say “they don’t make ‘em like this anymore”, then I don’t know what does. What is there to say about Opium that hasn’t already been said? Many bloggers, enthusiasts and journalists have waxed lyrical about the glory of Opium, so what could I possibly add to the discourse that is new or interesting? Well, my experience with the scent differs from others in the sense that I came to Opium in its latest incarnation a few years ago. Opium has changed since its launch, that is an undeniable fact (change goes hand-in- hand with ageing), and many lament its transformation, stating that in its current form, the fragrance is a shadow of its former self. I have no experience with vintage Opium so I cannot comment on the differences between the old and the new, but I will say that if the current Opium isn’t as good as the former, then the old stuff must have been pretty phenomenal! So what makes Opium so iconic? Well the answer is spice, and lots of it! The opening sees a gigantic temple of spice built from pillars of clove, pepper and cinnamon, evoking the rich auburn colour of towering sand dunes and the deep reds of a burning sunset. At first it all feels impossibly dry and arid, but underneath all of the sharp, sour and barren carnation-like spice is the plushness of mandarin orange, that leads one to think that Opium is more of a purring lap cat than a snarling lioness. The heart is a hot desert wind of flowers. The spicy, oriental tones of ruby red roses are whipped up into a frenzy, accentuating and extending the piquancy of that spice rack of an opening. Jasmine gusts in to add a sense of skank and indole that provides even more meat to Opium’s already plump bones. Opium’s spicy top notes and floral heart are bold, buxom and beautiful, but it is the magnificent dry down that really makes this fragrance a most resplendent Queen. In the base, Opium pairs resinous opoponax with a rigidly structured amber of immense quality. The former brings a dark and almost savoury nuance to the composition, whilst the latter teams with with vanilla to provide something that is softer and cuddlier. Linked by the multi-faceted character of patchouli, these two opposing forces cancel out each other’s sharper accents, rounding of the edges and creating a perfect and smooth base line that supports one of the most glorious olfactory tunes every played. Opium earns its place as one of the greatest perfumes of all time. It is a fragrance that takes no prisoners and has no absolutely no fear, but most of all it is a testament to the genius of Yves Saint Laurent, a man who empowered women through his fashion, and his fragrance. Opium is a shining example of such empowerment and every perfume lover worth their salt owes it to themselves to smell it. This entry was posted on Thursday, October 23rd, 2014 at 9:32 am and is filed under Candy Perfume Boy, Fragrance, Tried & Tested. You can follow any responses to this entry through the RSS 2.0 feed. You can skip to the end and leave a response. Pinging is currently not allowed.